Study Weekend, the premier gardening conference of the Pacific Northwest, returns to Portland June 28-30, 2019. The Hardy Plant Society of Oregon is pleased to organize and host this gathering of passionate gardeners, who will hear from leading gardening speakers, tour beautiful gardens, shop plant and book sales, attend workshops, and meet and mingle with fellow enthusiasts throughout the weekend. Registration for Study Weekend 2019 is limited to 450 participants. The following pages are designed to give you plenty of reasons to sign up early and insure you are in attendance when we gather in June. Learn more below. The Study Weekend is SOLD OUT. We are no longer accepting names for the waiting list. Unstoppable forces have entered the garden. Climate change, habitat loss, resource scarcity -- even our own aging -- make clear that the pursuit of a beautiful garden no longer justifies all the means. Is it time to abandon conventional wisdom and expected outcomes and seek new approaches? Can we transform the garden and the gardener? Join us to contemplate, discuss and explore gardening, reimagined. The Hardy Plant Society of Oregon's 2019 Study Weekend begins on Friday, June 28, with Optional Pre-event Workshops and Open Gardens in Northeast/North Portland. 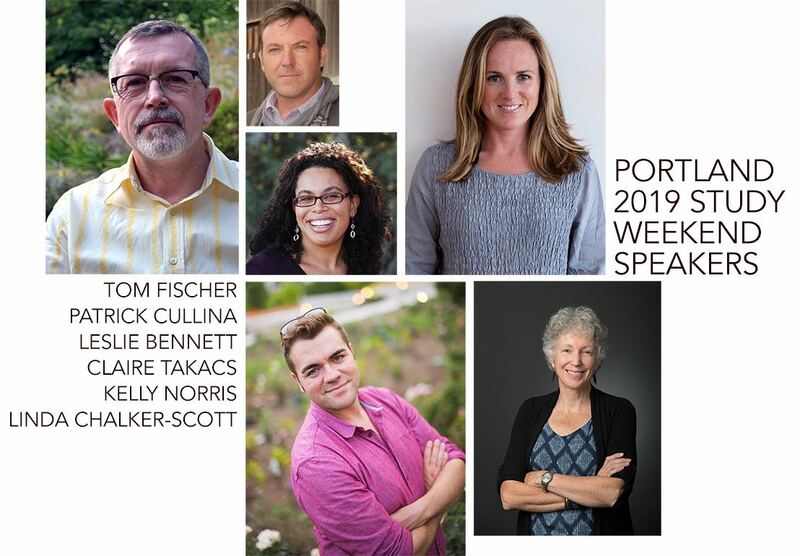 We have a great line-up of speakers to inspire you at this Portland 2019 Study Weekend. To kick it off, on Friday evening, Tom Fischer gives our keynote talk, "Dreaming Deeper: A Who's Who of Ground-Breaking Gardeners." Saturday morning, look forward to Patrick Cullina’s talk about the role of dynamic landscapes in transforming our communities, Leslie C. Bennett addressing the use of edibles in the garden, and Kelly Norris helping us to reimagine the perennial palette, before heading into Southwest Portland to view an array of gardens. Sunday morning, Claire Takacs will use her exquisite photos of gardens from around the world to give us a new way of seeing gardens. Then Dr. Linda Chalker-Scott addresses good plant science and the use of native plants. In the afternoon, head out again to see gardens, this time in Washington County and on and near Sauvie Island. The entire Study Weekend is filled with these great talks, open gardens, a Plant Sale with hundreds of plants from select vendors, a Book Sale, featuring books from our speakers and others befitting the theme. During breaks, make sure to check out the Botanical Display. A multitude of Door Prizes, including books, plants, art and gift certificates, are given away to attendees with special attention to non-plant items for our Canadian guests. You just need to be in your seat to win!! Weekend attendees also have an opportunity to bid on fabulous Silent Auction items...from plant collections to garden art to trips and tours. Money raised from the auction supports HPSO's grants and scholarships supporting regional gardening education projects and programs. Optional Study Weekend Events include workshops at regional public gardens and a Saturday evening soirée at Pomarius Nursery (limited to 200). Portland Study Weekend unfolds under a new roof in 2019, at the Crowne Plaza Portland-Downtown Convention Center. In addition to its convenient location, the venue offers excellent facilities for our conference, and guests staying at the hotel through Study Weekend special rates enjoy air-conditioned rooms with refrigerators and microwaves, wireless internet, indoor pool, a spa tub and 24-hour fitness center, concierge services, gift shops and newsstands, restaurant and bar, and transportation connections including complimentary area shuttle service to nearby attractions. We are pleased to announce Bartlett Tree Experts as our Lead Sponsor for Study Weekend 2019. Bartlett Tree Experts was founded in 1907 by Francis A. Bartlett and is the world's leading scientific tree and shrub care company. Arborists in their Portland, Oregon office are committed to helping local residents and businesses maintain beautiful, healthy trees and shrubs. Bartlett Tree Experts arborists are experts in diagnosing and treating tree and shrub problems specific to the Portland area. Plus, with access to Bartlett’s global resources and advanced scientific research facility, they can provide customers with benefits that just aren’t available from other Portland tree services.